StoreDot is an Israeli startup company that was established in 2011 to develop and commercialize new peptide-based technology originally discovered in Tel Aviv University. Storedot's technology allows them to synthesize new nano materials ("inspired by nature") that can be used in a wide variety of application - displays, batteries, memory and more. StoreDot invited me for a visit in their offices (thanks guys!) to learn more about the company and the technology. The company's display technologies may compete and complement OLED panels, so this should be an interesting company to watch. So a peptide is made from short chains of amino acid monomers, or a simple protein. The major IP of StoreDot is a process which stops the peptides from self-assemble into large nanotube structures. Using their process, the peptides assemble into small structures. StoreDot then combines them with proprietary compounds which turn them into a quantum-dot like material (StoreDot calls them NanoDots). But StoreDot's NanoDots are organic and metal free, and also smaller than any other kind of quantum dot. The company originally aimed to develop a memory device based on these NanoDots (hence the StoreDot name), but following a large investment (over $6 million) in which a large Asian display maker participated, the company changed their focus to displays. 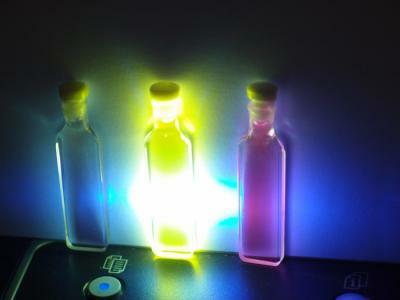 Nanodots, like quantum dots can emit light using two mechanisms - photo-luminescence and electro-luminescence. Photo-luminescence means that this material emits light when it being hit by photons (i.e. it is being lit upon). Phosphorescence for example is a type of photo-luminescence. The idea is that the quantum dots change the wavelength of the light (upscale it). This kind of effect is the one used by several companies today to create a QD film that turns a blue LED light into red and green light and thus creates a "better white" color which enhances the color gamut of LCDs. Sony now has several TVs and small LCD panels on the market that employ QDVision's QD films. StoreDot's technology can be used to create such films, but actually that's not the focus of the company, even though they believe they could have such a product ready within a couple of years. The images and video you see in this article are showing StoreDot's compounds' photo-luminescence in action. The company is currently developing a new NanoDot based display that uses NanoDot's electro-luminescence property. Here the materials emit light when electricity is applied - similarly to OLED emitters. In fact you can basically replace the organic emitter in an OLED display with StoreDot's peptide compounds that emit light when electricity is applied. They term this technology BiO-LED or Bio-Organic LED. StoreDot says that a BiO-LED emitter has three main advantages over current OLED emitters. First of all, it is very easy to process. In fact StoreDot says that their compounds can be evaporated, they can be put into a solution (patterned using ink-jet printing, for example) and they can also be chained to polymers and be processed using micro-electronics production technologies (for example photo-lithography). StoreDot's compounds are quite stable and a BiO-LED display will offer tens of thousand of hours of lifetime, although they do not have exact measurements yet. In addition to being environmentally green, the biggest advantage of these materials is that they do not oxidize. Unlike OLEDs, they are not sensitive to the environment, and StoreDot showed me some sample films in their office made a couple of months ago which are still working - without any encapsulation at all. They have various methods to deposit the materials, and they say that the deposition process basically includes a simple "encapsulation" which is enough. OLEDs are very sensitive to oxygen and water, and encapsulation is one of the biggest challenges towards flexible OLED displays, so this may be a great advantage over OLEDs. The final advantage of BiO-LED displays are that the materials are readily available and are very cheap. They are using compounds and peptides widely used in other applications today and have a "secret recipe" of how to synthesize them. Of course this is early stage technology. StoreDot hopes to produce a simple BiO-LED flexible display prototype by the end of 2014 and they believe that if all goes well, a BiO-LED display might be commercialized in 2017 or so. The company is also working on a battery prototype. This is actually a hybrid supercapacitor in which both electrodes are coated with NanoDots and also the electrolyte is NanoDot-enriched. According to initial experiments, this enhances the capacitor's density and charging speed. As I understand this, the battery technology is at a very early stage though, and the company is yet to even produce early prototypes. I hope we'll hear more from StoreDot soon. Good luck guys!